M45 Marketing Services won two gold 2016 ADDY Awards from the American Advertising Federation’s (AAF) northern Illinois branch at an awards celebration at Prairie Street Brewhouse in Rockford. Gold award winners Peggy Drane and Julie Beach (first and third from left) were honored for their work on a direct mail postcard campaign completed for FHN’s Ob/Gyn team. 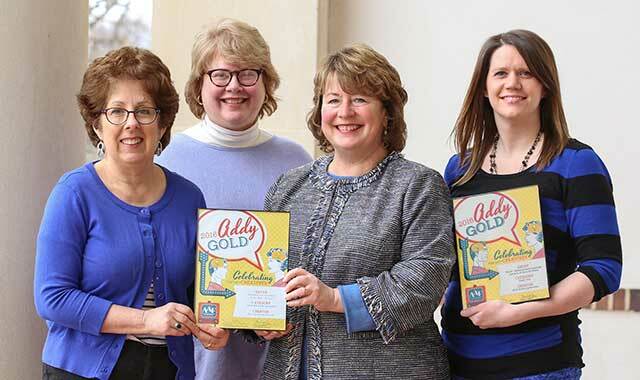 Marilyn Smit and Mindy Becker (second and fourth from left) were awarded gold for a brochure they produced for Interpro Translation Solutions, a Lisle, Ill.-based company that delivers world-class language translation services to a global audience. Sometimes you can’t hesitate. You just have to make a move, even if it’s scary. That’s what Marilyn Smit and Joe Vaske did in 2001, after learning that conglomerate GE was planning to acquire their longtime employer, Honeywell International. Both worked at the offices of Honeywell Sensing & Control, in Freeport, located about two hours west of Chicago. Smit was vice president of communications for Honeywell’s corporate e-Business group; Vaske was the communications manager overseeing all aspects of Honeywell Sensing and Control’s promotional, technical and digital communications. They learned GE planned to reduce Honeywell’s communication department from 20 people to one, and to outsource most of the work. “We proposed, ‘If you’re going to outsource, how about we start a company and you outsource to us?’” recalls Smit. It made sense. Smit, Vaske and the staff already understood the highly technical products. Less than eight weeks after the plan was approved, in June 2001, they had set up M45 Marketing Services. “M45” is the scientific name for the Pleiades constellation, the brightest star cluster seen from earth without a telescope. “Stellar ideas – down-to-earth solutions” would become their tagline. It was a leap into uncharted space for the two executives. “We were familiar with how the HR, IT, Legal and other departments worked, but we’d never had to oversee those functions at Honeywell, so we had a steep learning curve,” recalls Vaske. The duo brought 12 people with them from Honeywell. Today, M45 employs 22 full- and part-time employees. “We started with one large client – Honeywell – and devoted ourselves to making sure they were absolutely delighted with our work,” recalls Smit. As it turned out, GE didn’t acquire Honeywell, much to the chagrin of GE’s then-CEO Jack Welch. The European Union nixed his grand plan. But the outsourcing plan went forward anyway. Fifteen years later, the M45 staff still works closely with Honeywell contacts to understand technical products that not only need to be promoted, but explained. And not just in English, either. M45 works with people around the globe. “We have teleconferences at some pretty strange hours for us or others on the call,” says Vaske. In its first year, M45 worked out of one of the Honeywell buildings in Freeport. “After the first year, we realized that if we were going to take on other clients, we needed our own location,” says Vaske. M45 moved to its present location, a handsome older building at 524 W. Stephenson St. in 2002. At about the same time, the director of marketing left at FHN, then known as Freeport Health Network. “I knew FHN’s then-CEO Dennis Hamilton through community work we’d done together,” Smit recalls. “It was a moment of good fortune for us and for FHN.” She began working with FHN marketing as well as working with FHN executives on a longer-term plan that eventually brought all of the marketing work into M45 a year later. The arrangement has been mutually beneficial. By 2007, Smit and Vaske had purchased two marketing companies from Bloomington, Ill., and folded them into M45. “They had good people and good clients, including some who knew us from our work for GE and Honeywell,” says Vaske. Things were rolling along nicely – until the 2008 recession struck. During that time, M45 volunteered to coordinate local marketing for the TV show “Extreme Makeover: Home Edition.” The Stott family home in Lena, Ill., was renovated during the 2009 season. In 2011, M45 purchased Omnia Marketing and Design in Rockford. “Again, these were good people with good clients,” says Vaske. Among them was Dixon, Ill.-based Raynor Door, with dozens of individual dealers. During the past 15 years, the M45 active client list has grown to include Midwest Orthopaedics at Rush in Chicago; UniCarriers Forklift in Marengo, Ill.; Ronk Electrical, out of Nokomis, Ill.; Forster Products, a reloading and gunsmithing tools company based in Lanark, Ill.; and Adkins Energy, an ethanol and biodiesel plant in Lena, Ill.
Smit and Vaske credit their team of “bright stars” for making M45 so successful. The owners cherish the “work hard, play hard” culture they’ve cultivated and the ability to know each employee individually. The staff also takes time for office hijinks, like the “truly hideous” white elephant gift exchange and a competition to find the most creative Peeps displays. “We have interesting people working here,” muses Smit. “One of our graphic designers is a champion weightlifter who can bench press 556 pounds. One of our technical writers was in the U.S. Navy and makes beautiful jewelry. One of our primary client managers is a librarian, by training, with a history degree. These are people who can be flexible, wear lots of hats and thrive on learning new things. The owners avoid pigeonholing M45 as an ad agency or a PR company. “If you do just one thing then you’re like a hammer and everything looks like a nail,” says Smit. Another factor behind M45’s success is the complementary skill set its owners possess. Vaske provides a steady hand, cool logic and no shortage of dry wit. Smit is warm, outgoing, creative – an adventurer. Both are down-to-earth straight-shooters with keen minds, equally at home in a Fortune 500 boardroom or at a county fair. “Each of us grew up on family farms, so we share a certain work ethic, similar values,” Vaske says. Smit’s farm was in Mount Morris, Ill.; Vaske’s was in Farley, Iowa, near the “Field of Dreams” filming location in neighboring Dyersville. When that famous farm came up for sale, M45 helped to market it. During its 15 years, the primary objective of M45 has remained constant. It’s this attitude that makes the team so likable. And this matters. This entry was posted on Tuesday, July 18th, 2017 at 11:59 am	and is filed under Northwest Business Magazine. You can follow any responses to this entry through the RSS 2.0 feed. Both comments and pings are currently closed.